I awoke at dawn on the Ambler River in northwest Arctic Alaska. Something was moving just outside the tent. Slipping from my sleeping bag, I unzipped the tent door and peered around a fringe of autumn-bright willow. Instead of the caribou I'd expected, there stood a lone gray wolf, nose to the riverbank. It lifted its head and stared at me with intent green eyes. A stone's toss apart, we studied each other in the morning silence. At last the animal—a young female, I guessed from its narrow build—turned and trotted off, north up the mountain-rimmed valley. I watched her, as grateful as I had been when I met my first wild Alaska wolf 30 years ago. Even in the remote Arctic, glimpsing Canis lupus at close range is a rare experience. I've known many people who've lived for decades in wolf country and never seen more than tracks. Despite this, wolf populations in several parts of Alaska (along with grizzly and black bear numbers in some regions) are being reduced by a controversial, escalating predator-control program. Currently, there are six active predator-control areas in the state, encompassing more than 67,000 square miles. Within these areas, not only may prescribed numbers of wolves be killed using airplanes, but also orphaned pups may be gassed in their dens, and liberal sport hunting and trapping regulations allow additional and virtually unlimited take. In some areas, chasing down wolves with snowmobiles is legal. The removal goal ranges from 60 percent to 100 percent of estimated wolf populations in each of these areas. Black bears and grizzly bears are targeted in several of the predator control areas, including Unit 16 across Cook Inlet from Anchorage. There, black bears of all ages and sexes, including females with cubs, may be snared or killed from tree stands at bait stations. Nonresident sport hunters pay thousands of dollars for the privilege of shooting up to five animals each; for residents, there is no limit. The goal in Unit 16 is to remove 900 bears over three years, roughly half of the estimated population. Grizzly bears are targeted through liberalized sport hunting policies in other predator-control areas. View a map of the predator-control areas. "The bottom line is that this is a politically driven program," says Caroline Kennedy, senior director of field programs at Defenders of Wildlife. "There is little credible science to justify what Alaska officials are doing. "Under the direction of the Alaska Department of Fish and Game (ADFG), private airplanes and state-leased helicopters are used to chase down and kill wolves over six areas, totaling more than 67,000 square miles. More than 1,000 wolves have been killed using aircraft since the current program was launched in 2003. In 2008, when then-Alaska Gov. Sarah Palin was named as the vice-presidential candidate of the Republican Party, the issue was cast into the national spotlight. Palin and her supporters claimed that predator control was necessary to boost caribou and moose numbers for rural Alaskans whose livelihoods or diets depended on game animals. Opponents called the program cruel and unnecessary, and questioned who really stood to benefit. Although Palin has stepped down, the debate rages on both inside and outside Alaska. Each extreme of the argument claims the high ground as their sole province. But what often gets lost in the battle over hearts and sound bites are questions about the science behind Alaska's predator control program, and the politics that drive that science. In certain parts of Alaska, especially places where residents of Anchorage and Fairbanks often hunt, state officials contend wolves and/or bears are keeping caribou and moose numbers too low to satisfy human demand— and that fewer predators would translate into more game for humans. 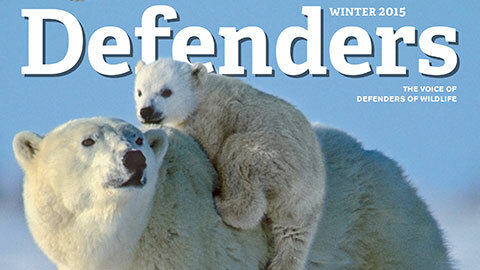 "It's all about producing more," says Doug Larsen, ADFG's director of wildlife conservation. "If habitat can support more caribou and moose, which translates into more individuals filling their freezers, shouldn't we try to do that?" Setting aside moral and political questions, there are scientific issues with this rationale. As many studies show, other factors besides predators can exert a huge influence on prey populations—quality and quantity of available food, competition or interaction with other species, the effects of wildfires or weather, climate change and so on. Disease and hunter harvest also may play significant roles, and the effects of these interacting forces are notoriously difficult to sort out. Says ADFG wildlife scientist Kimberly Titus, "People want these [predator control] areas to be simple. They are not simple at all. You can do everything right to reduce predators, and still get no response." Another, more fundamental issue is there are few accurate counts of wolves and bears in the control areas. In some cases, accurate counts of prey species are also lacking. The population information that is presented by state officials is often based on mathematical extrapolations, anecdotal information from locals and surveys rather than rigorous census studies. So the basic biological information crucial to determining whether predation is limiting prey numbers is sparse. In addition, detailed studies on habitat and adequate analyses of the outcome of predator-control programs are lacking in some areas. "Any competent biologist would recognize that many of these numbers amount to smoke and mirrors," says Vic Van Ballenberghe, a well-respected Alaska moose biologist. But, he adds, "whether sound science has been done or not isn't the issue. It's the low standards used to justify the current programs." He and other experts warn of trying to produce more moose than habitat can support, which will result in repeating population crashes and an endless cycle of predator control as managers again blame wolves for the declines. While defending their work, even ADFG officials concede that their data isn't always complete. Titus says, "Our level of knowledge varies somewhat widely across the programs in terms of whether reductions in wolves in particular results in cause-and-effect to increase ungulates. I'm not surprised that this would be so, given financial constraints, environmental factors and the remoteness of some areas." Van Ballenberghe is far from alone in his criticism, nor is it new to Alaska officials. The American Society of Mammalogists adopted a resolution on the issue and relayed it to then-Gov. Frank Murkowski. The society also communicated their concerns regarding the science to Sarah Palin shortly after she was elected governor; groups of scientists in 2005 and 2007 sent letters with more than 100 signatures each to Govs. Murkowski and Palin; and in 1996, an in-depth review by the National Research Council (NRC) was completed, at the request of ADFG during the administration of Gov. Tony Knowles. While the report commended the department for the quality of some of its research, it found Alaska's predator-control program wanting in key respects, and made a number of specific recommendations. "Here's the tragedy," Van Ballenberghe continues. "The NRC review was a fine report by a blue-ribbon panel of biologists. It was no less than a blueprint for conducting a sound predator-control program. But the findings have been ignored. The state just flat failed to do it." Larsen disagrees, saying the department has acted on some of the NRC recommendations. He also points to time, personnel and funding—resources that are always in short supply. "We can't do five-million-dollar research projects all over the state. It's just not going to happen." He notes that even the NRC agreed that appropriate study data could be extrapolated, and defends ADFG's reliance on "the best available science"—which, according to critics, is far from the best science that could be available. However, the primary force that propels Alaska's predator-control program is not science, but policy and politics. First and foremost is the intensive management law. Passed by the Alaska legislature in 1994, this law mandates, among other things, that prey species in high-demand areas be actively managed for high-yield human consumption. Management and harvest goals are set for moose and caribou at historically high levels—numbers that many biologists feel are unrealistic or unsustainable. The goals are based on figures from decades ago, when wolves and bears were ruthlessly exterminated across the state with poisons, traps and aerial hunting, which temporarily caused moose and caribou numbers to soar. But as a state agency, ADFG is bound to follow this law, the engine that drives predator control. Intensive management continues to pose thorny questions—so much so that The Wildlife Society, an organization of professional biologists, decided to conduct a technical review of Alaska's control program. Thanks to intensive management policies, there are now so many moose in Unit 20A (the program's showpiece) that state biologists fear a habitat-related population crash. Yet local citizen advisory boards have repeatedly opposed cow moose and calf hunts to reduce the herd. "So, what if intensive management succeeds, and we do produce all these animals?" asks an ADFG research biologist, who asked that his name not be used. "Intensive management requires hunters to behave like wolves, and take the same animals the wolves would—cows, calves, the sick and weak, as well as healthy bulls, and not just the easily accessible ones. What if hunters won't act like wolves? What then?" The intensive management law isn't the only political force that compels ADFG's predator-control programs. Add the fact that the department is led by a governor-appointed commissioner, and that significant wildlife management decisions are made not by the department, but by a seven-member board of game, also political appointees of the governor. Of the current seven, six have strong links to the powerful sport-hunting organization, The Alaska Outdoor Council (AOC). Despite a mandate in the state constitution that wildlife belongs to all of Alaska's citizens, the 46 percent of Alaska voters that opposed predator control without sound science in a 2008 ballot referendum are scarcely represented on the board. Neither do residents of the Alaskan bush—the very people who actually depend on wild game—have representation on the board. "When it comes to subsistence, the people living closest to that old lifestyle are often the least likely to have their voices heard," says Seth Kantner, a writer and photographer who lives in the small Arctic town of Kotzebue, hundreds of miles from the nearest highway, and was raised in the bush on wild meat. "These people avoid boards and meetings and arguments—besides, they're busy repairing snowshoes or drying caribou or something. So much of this wrangling over animals takes place hundreds of miles away, conducted by strangers—although plenty often we hear it alleged to be on behalf of subsistence peoples." Meanwhile, ADFG scientists are being restricted in their communications with the press over the predator-control issue. According to ADFG documents, biologist Sean Farley is being investigated for insubordination following a short mildly critical interview quoted in a recent Audubon magazine story on predator control. The sport hunting group Sportsmen for Wildlife (co-founded by ex-state senator Ralph Seekins, who co-sponsored the intensive management law) has called for the firing of Farley and other ADFG biologists deemed to be unsupportive of predator control, and the group continues to promote aggressive expansion of the program. Though critics may have hoped for moderation when Palin quit, new Gov. Sean Parnell has made clear his commitment to continuing her policies. "That's something I leave to the experts and I want to continue," he said in a September press release. However, Parnell has at least agreed to meet with opponents of predator control—a shift from Palin's policy of outright refusal to discuss the issue. Supporters of predator control claimed vindication this past autumn, when ADFG announced upward trends of moose and caribou numbers in all six predator control areas. However, when the department's own moose harvest records from pre-predator control (2003-04) are compared with those of 2008, the net total gain for all areas is just 30 harvested moose. And despite cycles of predator control and no predator control, colder and milder winters, and more hunters, Alaska's state-wide annual moose harvest over the past 30 years has remained remarkably consistent: about 7,000 animals. "After all the millions of dollars spent and the hundreds of wolves and bears killed, the state really has very little to show for it and they've tarnished the reputations of their biologists in the process," says Defenders' Kennedy. "It's shameful." Whether one is for or against predator control in Alaska, one is hard-pressed to interpret what's transpiring as anything less than large-scale manipulation of some of the best-preserved wild ecosystems on the planet in an attempt to bend nature to our bidding. Even if such actions could be justified by sound science, they seem a questionable course at best. Nick Jans is a writer and photographer who lives in Juneau, Alaska, and contributes regularly to Defenders. His latest book is The Glacier Wolf: True Stories of Life in Southeast Alaska (2009, Arctic Images; www.nickjans.com).